Fluoride is an important mineral for a healthy smile. Fluoride can actually remineralize your tooth enamel, or its outermost layer. This adds protection to areas where it is weak. Therefore, when harmful acids attempt to invade your tooth enamel and weaken it, fluoride acts as a defense barrier to protect your tooth from cavities. These harmful acids are produced from the bacteria that form from the sugars and carbs we consume. They will attempt to attack your tooth surface and demineralize the enamel over time. Therefore, it is crucial that you brush and floss regularly as well as get enough fluoride for extra protection. We can all benefit from fluoride. However, young smiles are especially susceptible to tooth decay and can therefore reap significant benefits from fluoride use. Many communities add fluoride to their city water, but not all cities do so. Also, if your child is only drinking bottled water, he or she may be missing out on the benefits of fluoride. It is essential that your child use a fluoridated toothpaste, as this is recommended by the American Dental Association. Finally, a routine fluoride treatment from your dentist can ensure your child’s smile is properly protected. It is important to know that getting too much fluoride is also possible. A condition called fluorosis can produce speckled white spots on the teeth and can be an indication that your child is getting too much, although this is rare. A simple cosmetic treatment from your dentist can correct the discoloration from fluorosis. If you are concerned whether or not your child is getting an appropriate amount of fluoride, ask your dentist. Your home water can be tested to determine how much fluoride is present. If it is found that your child is lacking proper fluoride amounts, then additional measures can be taken such as professional fluoride treatments. Fluoride treatments come in a variety of forms, including gel, rinses and tablets. 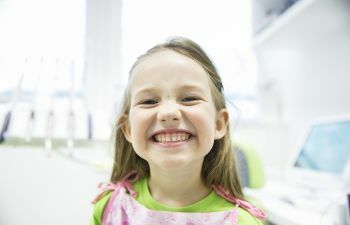 At Georgia Orthodontics & Children’s Dentistry, we have a pediatric specialty dentist who can evaluate your child’s teeth and level of fluoride protection to determine if fluoride treatments should be considered for your child.